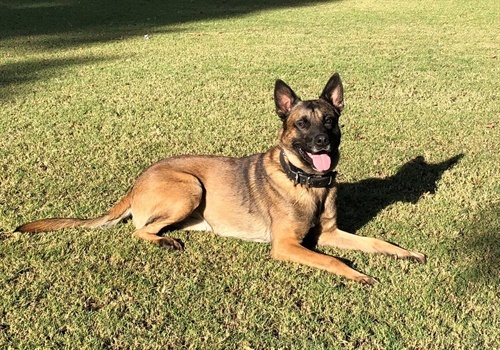 Phoenix Police K-9 Bane was killed after it was deployed to locate a suspect who had hidden in an attic after leading police on a pursuit and bailing from the vehicle a few hours earlier, said Phoenix Police Chief Jeri Williams. The incident reportedly began with a vehicle theft and pursuit Tuesday afternoon and ended with one woman arrested and a man in the hospital after what police called an officer-involved shooting. Williams did not immediately confirm the man was shot by an officer but said he was injured and taken to a hospital. She said, however, the incident was the 17th police shooting involving Phoenix officers. Police did not specify how the dog was killed, reports the Arizona Republic. The suspect was found on top of Bane before he was transported to a local hospital for treatment of his injuries, Williams said. K-9 Bane was a three-year-old Belgian Malinois who had served the Phoenix Police Department for a little over one year, according to Sgt. Jonathan Howard, Phoenix PD public information officer.